Do you grow your own food? If I had to solely grow my own food to feed my family, I would be in dire straits. We would be eating a lot of dandelion salad this time of year. But now that our late Spring has finally arrived in North Dakota, I am doing my best to start and grow vegetables. 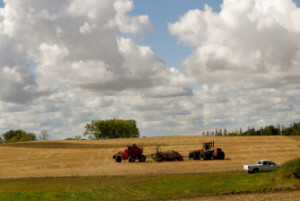 I am novice gardener but as a landscaper who did some work at our house last year told my husband “I can sure tell your wife likes to the dig in the dirt.” It’s the farmer in me as we are surrounded and immersed in North Dakota fields of wheat, barley, corn, soybeans, edible beans, sunflowers and canola. But yes so far, my biggest success at growing anything in the dirt of our formerly a hay field yard are fields of dandelions. Today my home office is sprouting up seedlings of squash, cauliflower, broccoli, cantaloupe, watermelon and pumpkins. We planted them on Mother’s Day and ignoring the seeds seems to be paying off. Last year’s first garden was a small success with primarily tomatoes and peppers. I paid little attention to the small garden other than some weeding and fertilizer. I actually grew food that my family could eat, other than dandelion salad. With bushels of tomatoes, I forced myself to learn to can and freeze food. My grandma gave me her genius insight and additional inspiration came from A Latte with Ott A (she is a fellow blogger of Real Farmwives of America). Both helped me get pushed over the edge to not only grow our own food but to can and freeze it to feed my family in the dead of the prairie winter. It saves on our family food budget and the whole gardening, canning and freezing process was therapeutic for me. So we are trying again this year grow our own food and expanding our vegetable gardening. A little of it is to grow our own food. Some of it is to save on our family food budget. The other part of it is forcing me to have time to dig in the dirt to grow vegetables that I can and freeze. It unwinds me. Yesterday morning, Mr. B the local rototiller man got to work at expanding our vegetable garden. Simple advice rings true. I like to do things I am good at and certainly don’t want to fail at gardening and growing food. But just as back up, I have my local grocery store stocked and ready to feed my family. Thank goodness I wasn’t a prairie settler and now am just a prairie dweller. Last night, I had help at the garden project. My husband is organized and detailed. 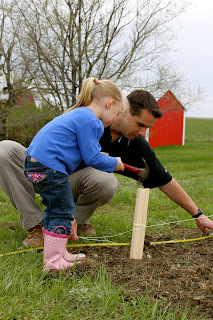 He had stakes and strings ready to go with a helper in Miss E to hammer them in the garden. The teenager got to work on mowing down the dandelions. Not only does vegetable gardening force me to dig in the dirt and unwinds me, it allows for fun family time. Before planting, I raked in 10-10-10 fertilizer according to the directions on the package. In the fall, we’ll put on some good rotten manure from a neighbor friend for next year’s garden. 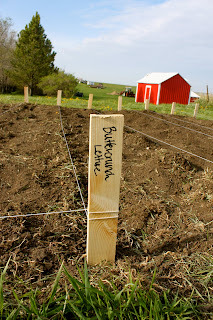 Last night, we planted seeds from Gurney’s that included sweet peas, Yukon Gold potatoes, carrots, spinach and lettuce. Tonight’s planting will include tomatoes, peppers, sweet corn and the seedlings from my office. Hopefully, we’ll be growing our own vegetables this summer with great success. But I don’t plan on growing any more dandelions. What do you plant in your garden? Thanks for the shout out. I’ll be anxious to see how everything grows and we are already making plans for canning week 2011!!! We have high gardening hopes this year too. So far what has come up is: turnips, beets, beans, tomatoes, watermelon, summer squash, zucchini, green peppers, and one potato (that I’d found under the fridge). The asparagus and eggplant didn’t make it. But I really hope what is up continues to thrive! I know what you mean about digging in the dirt! I was born and raised on a ND farm but grew into a teenager who went against everything mom and dad wanted, so I disliked the farm. Now I’m married to a farm boy and I am trying to get back into it. Started my first garden last year as and experiment with almost every veggie you could think of. By some miracle, everything grew! So this year I an trying those things we will actually eat and try to can pickles and beans as well. Good luck with your adventure! Your seedlings look fantastic! Looking forward to seeing how your garden grows this summer. We have yet to plant ours….hopefully within the next couple of weeks! I need a bottle that says “Bunnies-Be-Gone” I think it has a double-barreled nozzle! 😉 Dang things! I haven’t planted the first anything because I know they will just eat them up. I may have a lovely flower garden out there this year! Cookie baking…100th post of the year!